The latest season of Project Runway has been over for at least a week now and I still don’t know who the hell won that mess. I don’t know how many two-hour episodes piled up on our DVR while we were in Las Vegas but I haven’t been able to make it very far through one before I have to turn it off and go to bed. When I last checked in, the designers that made it into the top five were surprises to me, especially the chubby Hispanic guy with the huge mustache that designs for old ladies. That loopy Native American girl makes interesting textiles but they rarely translate into successful garments and the producers have done her a disservice by not telling her early on in the season that wide, staring eyes don’t make you look sincere; they just make you look crazy. The only one I’d like to see a whole collection from is rocker chick Michelle but that’s probably because I liked Kate Beckinsdale’s look in the Underworld movies and I’m also curious to see how far she can get with quilted leather and snap-on saddlebags. Maybe the reason I haven’t been able to commit this season is that there are more interesting things going on in the real world. 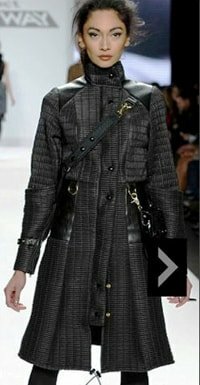 Michelle’s coat from Project Runway. 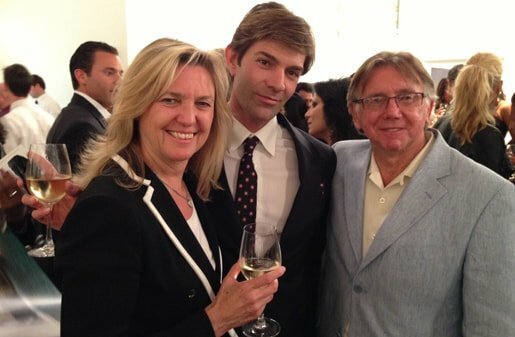 A few days ago, for instance, I attended a party to launch Paris Photo Los Angeles at Paramount Studios. This venerable art fair, arguably the world’s most prestigious event focusing on contemporary and historical photography, takes place every November at Paris’ Grand Palais. This was the festival’s first year in L.A., drawing sixty galleries and a dozen publishers to show their works in three big soundstages and the New York Street back lot, which seems a fun twist when you think how some aficionados were shocked that the organizers chose Los Angeles over New York location and here we were, kind of in New York after all. If you want to tie up Melrose Avenue and the surrounding area for four or five hours, just plan a party like this one. If I didn’t know all the back streets and nearly drive through the neighboring Hollywood Forever cemetery to get to a hidden staff parking lot and walk around to the main entrance, I might still be waiting to turn left at the light at Highland. 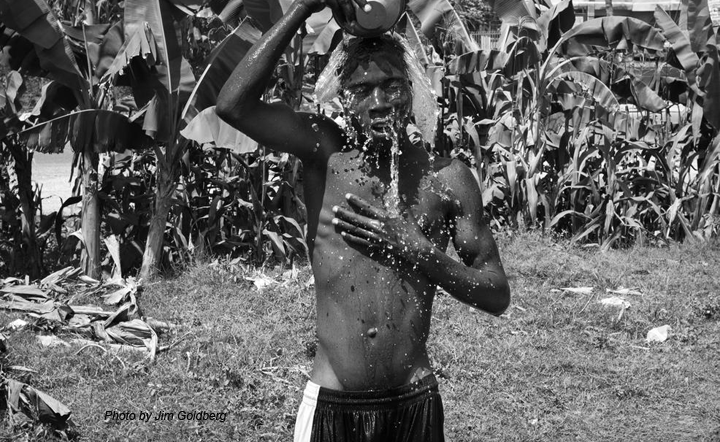 Once in, I was ushered to a cordoned off V.V.I.P section of the soundstage dedicated to an exhibit of Jim Goldberg’s photos of Haiti called “Acqua #3”, organized by Sean Penn and Giorgio Armani to raise awareness of the need for clean drinking water there. As is often the case with these things, there were too many people to really get a good look at all the works but the ones I did see were haunting, like the big bleak landscape that gradually reveals in one corner a small figure holding a plastic jug. It was great to see friends Ken and Julie Warwick and be again surprised by how tall Josh Duhamel is and by how, despite popular belief, people in L.A. really can pull themselves together and look great when they need to. One highlight of the evening was picking out the best looking of the handsome bartenders with my friend Mark Newman-Kuzel, who’d wandered in from a neighboring party. While we were getting champagne refills, Mark asked the striking dark-haired guy if he’d met any interesting people in the course of the evening. The guy sighed and said nonchalantly, “Not really.” I don’t know why, but I thought that was hilarious. Neighboring gallery at Paris Photo. As I walked out through the back lot, I thought back on the last time I was at Paramount Studios with my friend Shelley Winters at a benefit screening of A Place in the Sun. After all the hullaballoo of getting her wheeled into the packed screening room and figuring out where everyone was going to sit, we had to leave after a few minutes because she started crying. She claimed it was because the movie made her sad but I suspect it was because Liz Taylor was so gorgeous and, even though Shelley was quite a looker at the time, it was hard to watch herself looking so plain in it. She often told a story about how director George Stevens found Liz showing her how to curl her eyelashes on the Lake Tahoe set and scolded Shelley for trying to make herself prettier. Monty Clift was pretty gorgeous, too, so it must have been hard for Shelley to be the homely one on that set. I tried to make it back over the weekend so see more of Paris Photo but, after the party, life got in the way and I never made it. Ah well, there’s always next year.